Papa John’s board voted to adopt a ‘poison pill’ aimed at preventing founder John Schnatter from getting a controlling stake in the company. FBN’s Cheryl Casone with more. Papa John’s stock spiral worsened on Tuesday, with shares plunging more than 8% in after-hours trading as the embattled pizza chain reported a major sales decline at U.S. stores amid a brewing battle with ousted company founder John Schnatter. The Kentucky-based company reported a same-store sales decline of 6% at North American store locations in its second quarter, outpacing the decline expected by analysts. Quarterly revenue fell more than 5% to $408 million, below the $425.5 million mark projected by Wall Street analysts polled by Thomson Reuters. Adjusted earnings declined 31% to 49 cents, falling short of an expected 54 cents. Papa John’s lowered its full-year earnings estimate to between $1.30 and $1.80 due to the weak quarterly results and said it now expects North America same-store sales to fall by between 7% and 10% for the year. Schnatter stepped down as chairman last month after his use of a racial slur during a May media training session went public. He accused Papa John’s of forcing his resignation without a proper investigation and has vowed to challenge any attempt to oust him from the company’s board. The company said it expects to "incur significant costs as a result of the recent negative publicity” of between $30 million and $50 million as it revamps its marketing efforts and brand images at “nearly all” of its store locations. The cost estimate also accounts for a third-party audit of its corporate culture amid backlash related to Schnatter’s remark. Schnatter criticized Papa John’s in a statement released immediately after the company reported weaker-than-expected second-quarter earnings. During a conference call with Wall Street analysts, Ritchie said the company’s internal research had shown the need to move away from marketing campaigns centered on one person, such as the chain had used for years under Schnatter’s leadership. "We are not dependent, nor should we be, on one person,” Ritchie said. Papa John’s has banned Schnatter from all media appearances and enacted a “poison pill” measure to prevent Schnatter from acquiring a controlling stake in the company. Schnatter remains Papa John’s largest shareholder. The pizza chain has struggled in recent quarters amid tough competition from rivals Pizza Hut and tech-savvy Domino’s. Schnatter initially drew scrutiny last November when, while still serving as Papa John’s CEO, he blamed a sales decline on the company’s relationship with the NFL and its handling of player national anthem protests. Papa John’s has overhauled its sales strategy to address sagging revenue, with an emphasis on menu discounts, investments in digital technology and customer outreach. Schnatter stepped down as Papa John’s CEO last January. 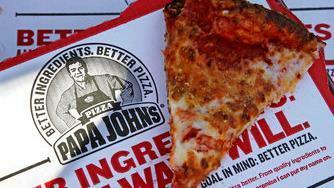 Pizza Hut replaced Papa John’s as the NFL’s official pizza sponsor last February. Papa John’s shares are down more than 20% so far this year.